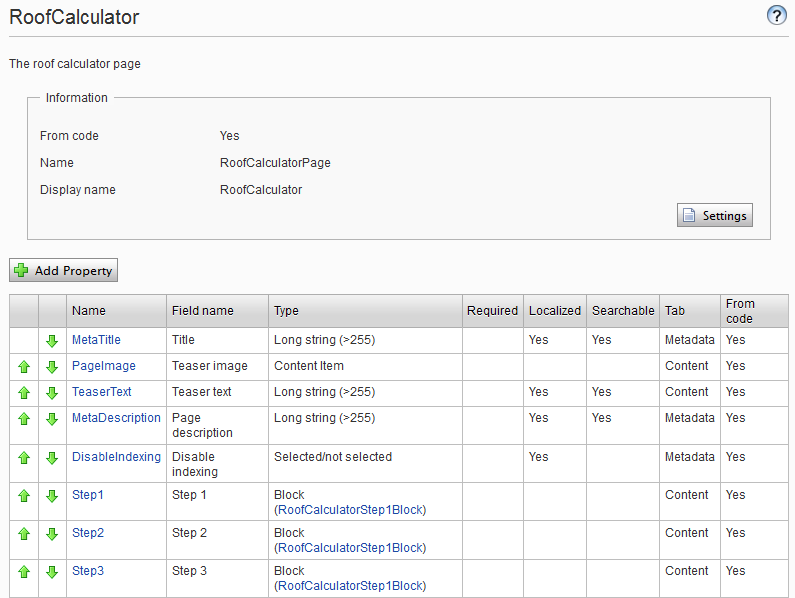 Description = "The roof calculator page"
I spot this fairly quickly – oops, a glitch there – fix it, and rebuild. Now everything is fine, right? Wrong! The situation is still the same, the admin GUI looking exactly as before. A bit perplexed, I blink, and go back to my Visual Studio window. Yes, I did really build, the text “Build succeeded” is still visible at the bottom of the screen. I go to the browser, and hit Ctrl+F5. Same result. I rebuild, just for the heck of it, then refresh my browser again. Still the same. For a while I fiddle around in the admin GUI, thinking there surely must be some way of telling EPiServer to refresh the properties, since what’s in the DB is obviously inconsistent with what’s in the code. Nope! I find no way of doing this from the GUI. The only way I could find to fix the situation, was to comment out (remove) the properties from code, rebuild, refresh browser – which of course removed all the properties – and then comment the properties back in again, rebuilding and refreshing once more. This problem is actually quite serious. Why? Because, suppose another of the developers on my team decided to change a property from one type to another… Then I’ll not be able to see the update – and I might not even know about the fact that he’s just updated this particular type.